On Thursday, May 18, Border Patrol went into Los Angeles area Boyle Heights communities, knocking on doors to try to locate 22-year-old DACA eligible Cal State LA student Claudia Rueda, ultimately arresting and detaining her with significant federal resources and no justification. In the days prior to her arrest agents went to Claudia’s old apartment to ask about her whereabouts. On Thursday morning, they knocked on doors, took note of the cars, and stopped people on their way to work from her previous apartment complex. Agents also went to Claudia’s aunt’s house. The family did not open the door, as agents failed to produce a warrant. The agents then proceeded to knock on the neighbors’ homes, arresting another community member. In total, as they swept the area with complete impunity, they arrested seven community members, including Claudia and three from Claudia’s previous block. Six were from Mexico and one was from Guatemala. At that time of her arrest, Claudia was outside moving a family car to observe the street cleaning restrictions. Three unmarked cars surrounded her, and men in plainclothes exited the vehicles and began to try to interrogate her. They asked her for her name, and identified her as their target–a 22-year-old DACA-eligible student who has lived in Los Angeles for 16 years. They kidnapped her and brought her to the Border Patrol detention site in Chula Vista, hours from her home. These actions are unacceptable. Border Patrol continues to target Claudia’s family and community! The timeline here suggests that CBP/Border Patrol are retaliating against Claudia for successfully advocating in the face of her mother’s detention–which resulted from her collateral arrest in a joint CBP-LASD operation–just weeks earlier. We must stop Border Patrol from inflicting violence in our communities! They must stop targeting those like Claudia-that has exposed their abusive tactics. Claudia Rueda is 22-year-old immigrant youth who came to the United States in 2001. She set roots in Los Angeles and has been residing in Boyle Heights for years. Claudia is an active member of her community and started getting involved in community organizing when she was 17 years old. She attended Roosevelt High School and then went to UC Santa Cruz. She transferred to Cal State LA where she is currently pursuing a B.A. in Latin American Studies. Claudia has been an active member of the Immigrant Youth Coalition and California Immigrant Youth Justice Alliance, and was a Dream Summer intern. Claudia was detained at the Border Patrol Chula Vista station from Thursday until Friday afternoon. At around 4:30 pm on Friday, she was transferred to ICE Custody and transported to Otay Mesa (a private for-profit detention center run by CCA). 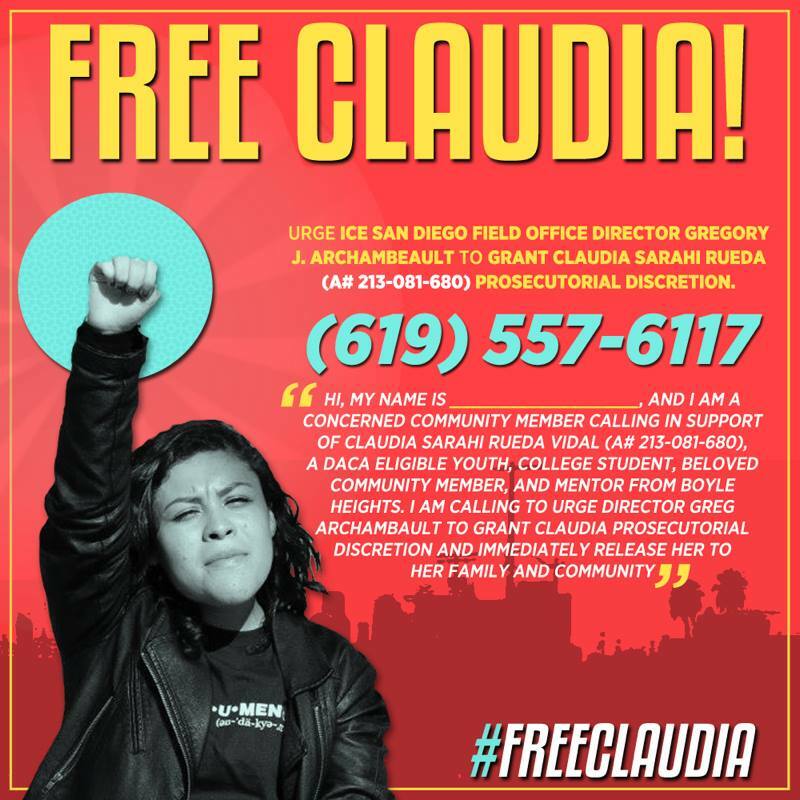 ICE has the power to grant Claudia prosecutorial discretion to prevent or stop any removal proceedings and release her to her family and community before a Notice to Appear is filed with the court. Urge ICE San Diego Field Office Director Gregory J. Archambeault to grant Claudia Sarahi Rueda (A# 213-081-680) prosecutorial discretion. I am a concerned community member/ from this organizing writing in support of Claudia Sarahi Rueda Vidal, (A# 213-081-680), a DACA eligible youth, college student and a beloved community member from Boyle Heights. Claudia has been a mentor in the community. I urge Director Greg Archambault to grant Claudia prosecutorial discretion and release her immediately to her family and community. Claudia Rueda has been living in the United States since 2001. She attended UC Santa Cruz and then transferred to Cal State LA where she is currently pursuing a B.A. in Latin American Studies. Claudia has been a mentor to many youth and community members in the state. Ms. Rueda’s deportation will cause emotional hardship to her family and the community. Hundreds of friends, professors, and community, legal, faith and advocacy organizations are in support of Claudia Rueda’s release. 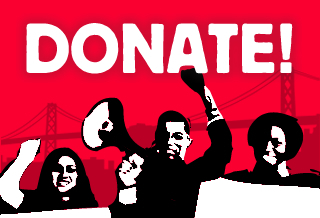 • If Claudia was a member, volunteer or active in your organization we ask you write a personal letter of support for Claudia to be submitted with her PD request or for her court proceedings. How can Claudia’s friends support? How can educational leaders support? How can the faith community support? < Join Our Summer Youth Program!